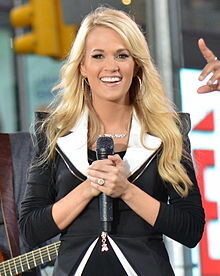 Carrie Underwood is an American country music singer, songwriter, and actress. She rose to fame as the winner of the fourth season of American Idol in 2005. She has since become a multi-platinum selling recording artist, a winner of six Grammy Awards, sixteen Billboard Music Awards, seven American Music Awards and ten Academy of Country Music Awards, among several others. As a songwriter, she has been nominated for a Golden Globe Award for Best Original Song. She is also a two-time winner of the Academy of Country Music Entertainer of the Year award and the first woman to win such an award twice (2009/10).